THE APPLICATIONS FOR THIS WORKHORSE OF THE TAG-ALONG TRAILER INDUSTRY IS LIMITLESS. HEAVY BULLDOZERS, TRACK EXCAVATORS, PAVERS AND COMPACTORS ARE EASILY LOADED AND SAFELY TRANSPORTED. COMPARED TO THE TRAILER INDUSTRY, THE MODEL SLG 20A2 CONSTRUCTION SPECIFICATIONS WOULD BE DIFFICULT TO MATCH. THIS 20 TON PAYLOADS AT HIGHER SAFETY FACTORS. THE BEAVER TAIL SECTION CAN BE CUSTOMIZED TO LOAD LOW-CLEARANCE CRAWLER TRACK ASPHALT SPREADERS WITHOUT GROUND SCRAPING. ANTILOCK AIRBRAKE SYSTEMS BECOME STANDARD AFTER MARCH 1998. EACH STANDARD AND CUSTOM TRAILER HAS UNDERGONE STATIC AND DYNAMIC DESIGN ANALYSIS. A LOW DECK-HEIGHT IS MAINTAINED WITHOUT THE NEED TO CUT ANY STRUCTURAL STEEL OR KNEE BRACES ABOVE THE WHEELS. 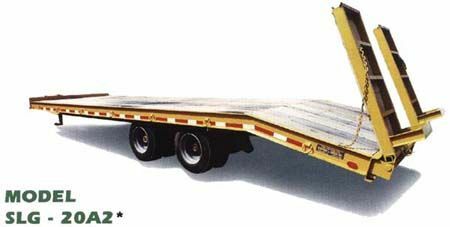 CUSTOM DECK LENGTHS FOR ANY TRAILER ARE AVAILABLE TO MEET THE CUSTOMER'S SPECIFIC NEEDS. THE ABOVE 35 FT. DECK IS DESIGNED TO MAINTAIN STABILITY WITH ITS LOW CENTER OF GRAVITY.